The fly zone: repels mosquitoes, ants, ticks, chiggers, flies and midges. Active ingredient remains effective for 70 washes.. 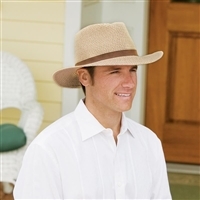 This weathered cotton outback hat features a 2.75" brim and a UPF 50+ rating. 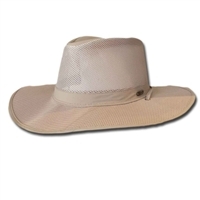 This small brim hat is designed with a snap on each side which allows for a band or scarf of your choice. The bac Pac traveller smooth leather has been treated with waxes and oils to guard against the elements. It is also fitted with a comfortable suede sweat band. Brim size 2.75".